What are the definitive skills you'd expect to see character possessing in a Judge Dredd styled game (with serial numbers filed off)? What do you think the law enforcement officers would need? What kinds of activities do you think might be dramatic if there was a chance that the player characters could fail? Would there be a different range of skills for gang members, corporate suits, mutants, or other groups inhabiting the world? These are my current questions. I haven't been posting much lately, because I've been making costuming and props for my regular LARP game. The most recent thing I wanted to produce was something along the lines of these. The first couple of times I used my LARP bow, I ended up with welts and bruises up the inside of my arm when the bowstring hit it repeatedly. So I decided that I needed to make something that added a bit of protection to that area. 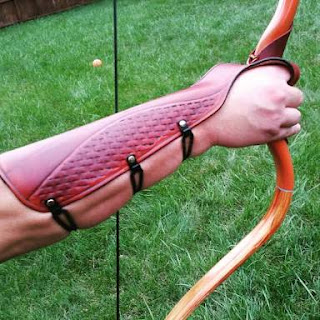 In ongoing use, I found that the bowstring hit my inner arm far less, so I probably don't need the protection any more, but in the heat of battle, with bowstrings drawn quickly and arrows shot off instinctively, the bracers will still prevent the occasional arm hit from the string. For the material used in this project, I had bought a few leather jackets from local second-hand stores, some black, some dark brown, some light brown, a range of leather thicknesses. On average about $6 each ($4-10) for an assortment of leather ready to go. They say things are worth what people are willing to pay for them. Sometimes I wonder about that. I've got stuff that has a big sentimental attachment for me. A massive miniatures collection that I've spent thousands of dollars on over the course of two decades, including a few painted pieces that have won awards at various conventions and tournaments over the years. But at least half of the figures are for games that are no longer in print. When times have been tough, I've been told by a few people that I should just sell them, but I haven't because In specific cases I remember painting each one (or, for the rest, at least vaguely remember painting each batch). For me the hobby is about the play, and the painting, and the imagination. The collectability of the metal (or resin or plastic) is just an aside. I could probably sell the figures for a few hundred dollars in batches (sold by game, sold by faction), I'd still have quite a few odd pieces left over. A game scenario which a bunch of generally independent variables. I say generally independent because they are each measured separately, but at the end we seem how many variables flip one way, and how many flip the other way, then apply a final outcomre bariable to the result. The premise is supernatural investigators, the game is basically a one-shot for these characters, it may tell a part of an ongoing narrative in the vein of Cthulhu stories where one investigation is linked to the next, all focusing on a single cult or supernatural entity. The entity itself is vastly superior to the investigators, and even it's minions could kill them with little effort...the minions of the minions might be a more even fight, but even then the outcome is probably against the investigators. I'm basically thinking of using a Cthulhu Dark framework for this. The independent variables are basically linked to the potential outcome. Over the years I've found that the kinds of people who scream "CULTURAL APPROPRIATION" are the kinds of people who give progressives and the left wing a bad name. There are cultures, there are people who belong to cultures, there are people to adapt the stories of their own cultures, and there are people who adapt the stories of other cultures. Sometimes the people who adapt the stories of other cultures, do so without understanding the context of those stories, and thus their adaptions ring false, or highlight the wrong things about the culture being presented. When this occurs, I've found it is often due to a lack of understanding more than anything else. Do not attribute to malice, that which could just as easily be attributed to stupidity. I've spent a decent part of this year reworking the LARP rules that our monthly games uses. Quite a bit of the game has seen regular playtesting, and the revamped version of the rules has been read over by a number of players from the game. They seem to think it makes sense, but it would be interesting to get some opinions from people who haven't participated in the game. A blind review of our game.